Heat oven to 350°F. Spray 8-inch square (2-quart) or 13×9-inch (3-quart) ceramic or broiler-proof baking dish with cooking spray. Heat 10- or 12-inch skillet over medium-high heat. Add oil and onion; cook 5 minutes or until onion is soft. Reduce heat to low. Add quinoa, chicken, black beans, green chiles, chili powder and 2 cups of the enchilada sauce; stir to combine. Remove from heat. Stir in Cheddar cheese. Transfer quinoa mixture to baking dish. Top evenly with pepper Jack cheese. Turn oven control to broil. 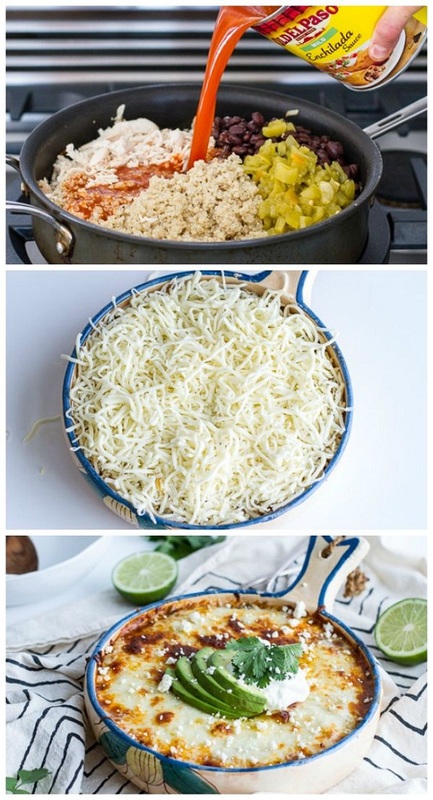 Place baking dish about 5 inches from broiler; broil 1 to 2 minutes or until cheese is golden and bubbly. Remove from broiler. Top with sour cream, avocado, cilantro and cotija cheese. Serve immediately.